In order to better know the corners of our town, choose a day to wake up very early and walk around Palafrugell. 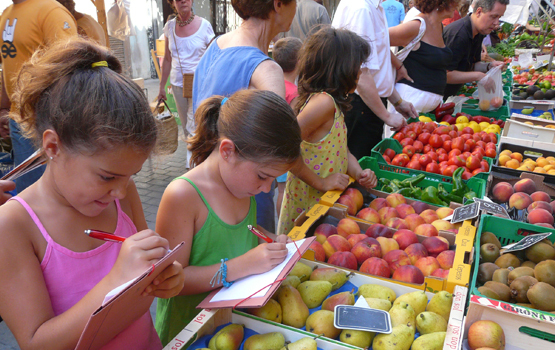 In order to better know the corners of our town, choose a day to wake up very early and walk around Palafrugell’s market (ref. 14) at Pi i Margall street. Have a look at the fruit and vegetables that grow in our land, their colors… Are they the same as those at your home town’s market? Discover the fish that we have in our sea at the indoor market. Can you identify them? And then go into the historical building of the meat market. Did you know that many years ago there was a fortified wall? Imagine how life used to be in the past! Look for a bakery called Can Baldiri on the same street. Buy a “xiu” or a “croissant” and eat it sitting down at one of Plaça Nova’s benches (ref. 15). That’s what local kids usually get for their afternoon snack. Yummy, hey?! With a full belly go to the Cork Museum to get to know about the cork trade and climb the stairs up to Can Mario tower (pic. 2 – route 3) to discover some other secrets about Palafrugell. After that, we suggest you to take a bicycle and pedal to Tamariu beach (pic. 3) along the path that starts at Tarongeta Street. Breathe deeply and get ready for the uphill and downhill slopes for 24 km. Before arriving to Tamariu, on the left side you should find a small path leading to a spring called Font d’en Cruanyes (ref. 16). Stop and cool off and you will only have one more descent before reaching the beach. Look for shells and funny stones in the sand, put your feet in the water… If it is not too cold for you and there are no jellyfish in sight, have a swim! Do you dare to swim all the way to the buoys? And to jump from the springbroad on the rocks at the right side? Put on diving goggles and explore the rocks to see fishes and other sea species. If you are lucky enough you may even find an octopus! You can also rent a kayak (pic. 13) and row all the way up to Aigua Xelida (ref. 17), a very nice little cove. After so many activities you deserve an ice-cram. Ask for it! To end a perfect day visit any of the swing parks in Palafrugell, at Coqui park or, if it is July or August, taking a ride on the little touristic train that links Calella and Llafranc.